The decision comes as the cryptocurrencies are gaining a foothold in mainstream finance. 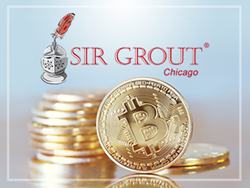 Sir Grout Chicago, a leading provider of hard surface restoration services in Chicago, has become the first company in its industry to accept Bitcoin and Ethereum, two of the world's most widely used cryptocurrencies, as forms of payment. The decision to accept Bitcoin and Ethereum comes as the cryptocurrencies are reaching new heights in markets around the world and are gaining a foothold in mainstream finance. Bitcoin and Ethereum are electronic forms of currency, also known as cryptocurrencies. They do not have a physical presence anywhere in the world, except on the internet, meaning that there are no physical "coins" like quarters or pennies. Encryption is used to generate virtual coins and manage the transfer of funds. Dan Lundstedt, co-owner of Sir Grout Chicago, sees both cryptocurrencies as a way to continue developing his business and as an opportunity to establish a competitive advantage in the industry, which has yet to embrace digital currencies. The use of Bitcoin grew by leaps and bounds in 2017, according to Forbes magazine. In November, Coinbase Inc., one of the largest Bitcoin markets in the world, added 100,000 users in a 24-hour period after the Chicago Board Options Exchange announced it would introduce Bitcoin futures on its trading floor. The Nasdaq Stock Market said it would follow suit later this year. As of December 21, there were an estimated 16 million Bitcoins in circulation, worth around $248.9 billion. Ethereum also skyrocketed in value in 2017. At one point, the cryptocurrency had gone up 5,000 percent in value since the beginning of the year, according to CNBC. During that same period of time, Ethereum had a market capitalization of $36 billion—the second largest of any cryptocurrency behind Bitcoin, which was valued at $48.9 billion at the time. Although Bitcoin and Ethereum are currently not common payment methods in the hard surface restoration industry, Lundstedt believes that early adapters of cryptocurrencies will appeal to the growing number of people who are investing in Ethereum and Bitcoin and are ready to spend them. "The era of the digital wallet is here, and we are excited to be offering these two new payment methods to our clients. We want every client to have a great experience with us, and that includes offering a wide range of convenient payment options. At Sir Grout Chicago, we have always prided ourselves on being at the forefront of technological innovation, whether we are talking about new hard surface restoration techniques, cutting-edge products, or payment methods. Bitcoin and Ethereum have come a long way since their inception, and we are confident that they will continue to become more and more mainstream in the years to come," said Lundstedt. If you are looking for superior hard surface restoration services in Chicago and want to pay with Bitcoin or Ethereum—or with more traditional payment methods—now you can at Sir Grout Chicago. For more information, visit http://www.sirgroutchicago.com or call (773) 661-6761.